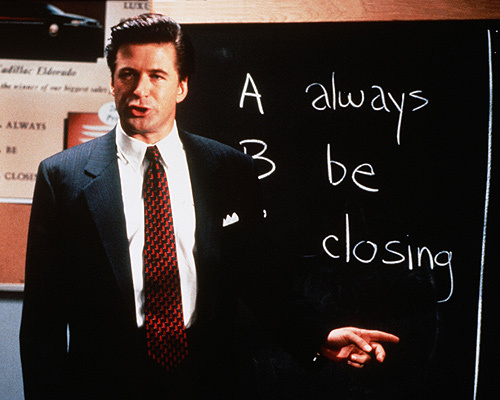 ABC – “Always be closing” if you’ve been in sales a minute you’ll be familiar with Alec Baldwin’s famous speech from the hit sales movie: Glengarry Glen Ross. Regardless of your thoughts on the character’s management style, being able to successfully ‘close’ the sale is the final and most fundamental piece of the jigsaw. The phrase “always be closing”, can consume even the most seasoned sales professional, but takes on a decidedly new meaning if you also happen to be self-employed. You’re always looking for new ways to open that potentially lucrative door, understand your prospects and make sure that you can deliver solutions that solve their problems. However, what Alec never considers is the minutiae of administrative burdens that go hand in hand with running your own business and can hinder a productive sales day, limit productivity and disrupt a healthy sales flow. Being able to maintain a healthy sales flow is an essential aspect of what makes you the most successful sales professional you can be. UK Sales Coach of the year 2014; Paul Atherton teaches this when he rightly talks about being able to master your 'inner game’ and 'outer game’ as well as the importance of ensuring that both aspects are well balanced enough to enable the sales agent to create a sustainable and productive sales flow. Maintaining a healthy sales flow can be tricky at the best of times, and this is especially true for self-employed sales agents. The decision to become self-employed and manage your own business brings many additional responsibilities that can take time away from critical tasks such as prospecting, lead generation, pipeline management and engaging with potential customers. A company will usually have a department that takes care of their employed sales agent’s administrative duties. This is designed to allow their reps to focus solely on prospecting and acquiring new business. In addition, an employee doesn’t have to worry about the additional day-to-day, non-sales related responsibilities that come with running a business. A self-employed or independent sales agent will usually have to take care of their own administrative duties. This can be anything from managing a working relationship with the companies they represent, to taking care of any number of day-to-day responsibilities that come with running your own business. Ultimately this can take valuable time away from prospecting and engaging with potential customers, leading to far fewer sales. What Is The self-employed sales agent’s ‘Home Game’? In addition to Paul Atherton’s inner sales game and outer sales game theories, we would like to expand on these concepts and introduce what we believe to be the third element to the self-employed sales flow; the ‘Home Game’. For a (commission-based) self-employed sales agent, the ‘home game’ encompasses every single thing that takes time away from prospecting, engaging and ultimately closing new business. Essentially these are the administrative distractions/duties that are essential when running a business, but stifle a healthy, fresh sales flow and have the potential to limit sales productivity. These may include, but are not limited to things like: keeping or finding new companies/complementary product lines to represent, product knowledge, training, access to up-to-date marketing materials, keeping various companies informed of your progress, submitting proposals, updating various CRM systems, invoicing, chasing and reconciling commission payments etc. All of these tasks eventually add up and ultimately reduce the amount of time the sales rep has to prospect for new business, manage their sales pipeline and engage with prospects. It’s a well known fact that to be most productive you need blocks of uninterrupted time and good organisation. The ‘Inner’, ‘outer’ and ‘home’ game strategies all require self-discipline, but we believe that there had to be a better way to help independent sales agents focus 99% of their time on prospecting, engaging and selling, while still getting all of the other things done. With a long background in sales, as well as managing a large team of remote working independent sales reps, it became obvious to us that the commission-only sales industry needed more than just another job website or standard online CRM system. As a small company that, at the time, relied heavily on self-employed sales agents to help grow our business, we found that it was not only incredibly difficult to find experienced commission-only sales people, but also that managing a quickly growing team became a full time job in itself. This inevitably took valuable time away from other important areas of our business that needed attention and quickly became a problem for us. At a high level, CommissionCrowd enables freelance sales reps to find and connect with great companies that understand how to work with you, manage your daily tasks and communications effortlessly, track deals, build your own sales teams and make money from their sales activities, get paid your commissions from within the system, leverage your contacts and finally get paid for referral business and lead-generation. But most importantly, keep your ‘home game’ sharp with our integrated collaborative CRM system, tasks, invoicing, click-to-call and other productivity tools. We decided that not only would CommissionCrowd have to improve the working lives of sales agents, but also improve the collaborative nature of newly formed working partnerships to also make things much easier for the companies they choose to partner with. We have created a place where great companies and experienced self-employed sales agents can come together, connect and work together easily. A place where agents can find exciting new complementary product lines and opportunities in the blink of an eye. A place that manages and eliminates the everyday mundane business tasks that takes precious time away from selling. We truly believe that CommissionCrowd will grow to become the home of the self-employed sales agent and that we are about to seriously disrupt and improve an age old industry that has been so badly neglected over the years. CommissionCrowd officially launched in private beta on March 15th, 2014. The three fundamental elements of our ‘core’ functionality include: The ability for companies and independent-sales agents to connect, collaborate and manage a remote working relationship easily and efficiently. Prior to having a launched platform or having carried out any of our planned post-launch Marketing activities, hundreds of experienced self-employed sales agents and companies registered to be notified as soon as we launch. An initial Market imbalance in numbers will almost always occur with any two sided Marketplace prior to launching to the general public. However, we are already in contact with some incredibly exciting potential partners that will enable both sides of our Marketplace to grow significantly after launch. It’s not just the early number of registered subscribers that have excited us. Although we have a huge amount of experience in the industry as both a company looking to find quality agents, as well as being independent sales reps ourselves it was important that we reach out to the sales agents and companies on our list and actually speak to the people that we are building CommissionCrowd for. How can I register early as a self-employed sales agent? How can I register early as a company?